For the last several years, we have been working towards a real Downtown Santa Clara with your support. We need you to voice your opinions at the following meetings. Agreement detail and the coverage area below. Thank you for your support in our mission of keeping the Old Quad a wonderful place to live, visit, and do business! Is the configuration of the street set in stone? No. This is just an option to purchase an easement where Franklin and Washington Streets once ran. We would like to complete the “Downtown Specific Plan” to determine if executing this option is right for the overall plan. When will this agreement become effective? This agreement between the land owner and city, if approved, would be effective once signed by both parties (sometime this summer) and would allow us to execute this option within 10 years. What are the costs now and in the future? The costs to execute the option now would be $2.6 million. There would be future costs (TBD) to relocate utilities and for improvements to the area within the easement. Does the City owe anything if we don’t make use of the option? No. The City will only be on the hook when the it executes this option within 10 years. Does this prevent us from creating a downtown specific plan? No, this has been a catalyst for the city to allocate funding and resources to developing a “Downtown Specific Plan”. What happens when developers want to work on the properties adjacent to the street? 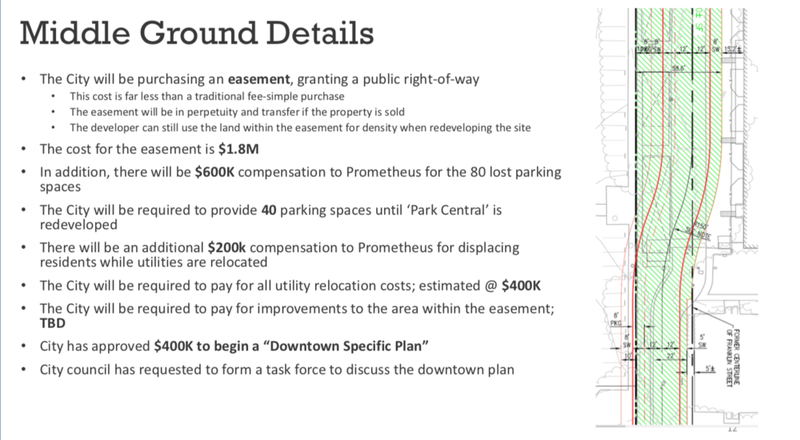 A developer and/or land owner will have a “Downtown Specific Plan” to follow. This plan lays out community/city expectations for this area. Anything proposed will still be required to be reviewed and approved prior to proceeding with developing.